“Figaro! Figaro! Figaro!” - the famous refrain that announces the arrival of the Barber of Seville and the start of what is arguably still the best comedy in opera. 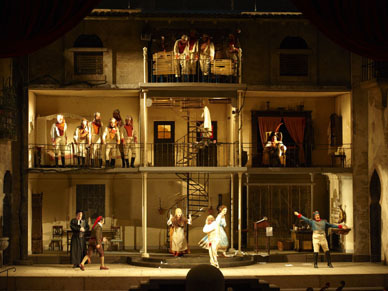 Based on Pierre Beaumarchais’ play of 1775, Le Barbier de Séville, and reputedly written in just thirteen days, the speed at which Gioachino Rossini composed this magical farce seems to have fed itself into the music and the story; both move at such a pace that the entertainment never lets up for a single moment. The eponymous Barber of Seville is employed by Count Almaviva to help him win the beautiful Rosina’s hand in marriage. At Figaro’s behest, the Count disguises himself as a student, soldier and teacher, in his attempts to hoodwink Rosina’s jealous guardian, Don Bartolo. In the end, Bartolo is as much exhausted as he is outwitted by the shenanigans of the other characters. Rossini judged The Barber of Seville’s premiere at Rome’s Teatro Argentina on 20 February 1816 to have been an unmitigated disaster. Even though Rossini originally titled his work simply ‘Almaviva’, in deference to Giovanni Paisiello, who had written his own Barber of Seville in 1782, Paisiello’s supporters were determined to voice their displeasure at Rossini stealing Paisiello’s thunder and booed the performers off the stage. Assuming that its poor reception had been down to shortcomings on his part, Rossini worked like fury to make improvements, but stayed away for the opera’s next night. This time the evening was a triumph and many members of the audience made their way to Rossini’s home to reassure him of its success. Unfailingly melodic, with music that effortlessly matches every twist and turn in the narrative, The Barber of Seville now makes a welcome return to Vienna and the Wiener Staatsoper.